Accident insurance is also more affordable than you might think. In fact, for a little over $20 a month you can get up to $112,500 of coverage. And that money can be used however you wish – for medical expenses or not. You can use it for things like mortgage or credit card payments, household bills, child care, etc. It’s entirely up to you. CLICK "GET A QUOTE" AND START AN APPLICATION HERE. Accident insurance covers more than you might think. It’s protection. It’s peace of mind. 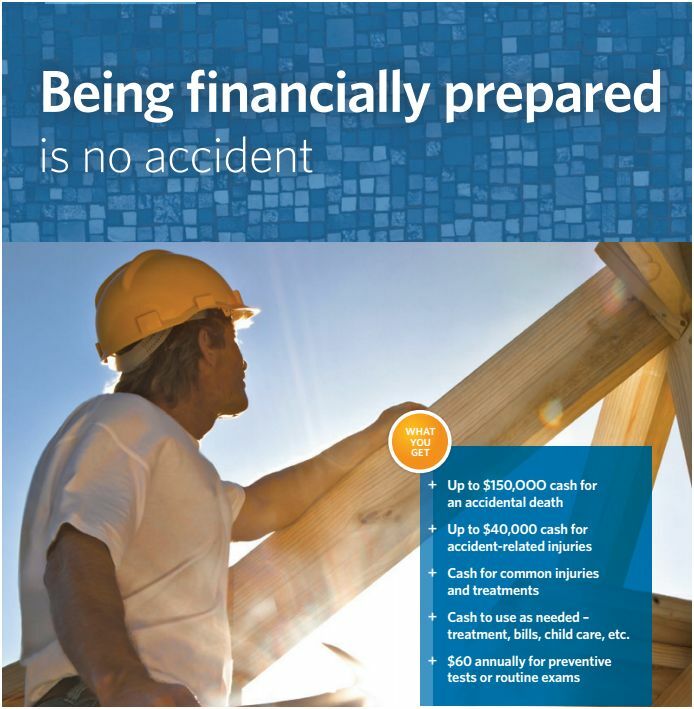 In the event that you have an accident (on the job or off), Accident insurance pays a lump sum of cash – up to $150,000. Depending on the amount of coverage you want, you can choose from two plans: Basic or Select.